The main objective of this report is to analysis Sustainable Tourism Development in Bangladesh. General objectives of this reports are to study the characteristics of sustainable tourism, to study principles of sustainable touris, to study the guideline of sustainable tourism, to prescribe the developing tourism in Bangladesh: Some Strategic Views and to highlight problems facing sustainable tourism development in Bangladesh. Finally this report make swot analysis Sustainable Tourism Development in Bangladesh. Bangladesh is a vacationland and it has many facets for local and foreign tourist. Her tourist attractions include archeological sites, historic mosques and monuments, resorts, beaches, picnic spots, forest and wildlife. Bangladesh is a river base country having attractive panoramic beauty. There are hills, vales, deep and mangrove forests, rivers and the longest beach in the world. In this country, the scope of nature based tourism, research based tourism, culture based tourism and eco-tourism is quite evident. In Bangladesh, prospective areas are present, minimum infra-structural arrangement is developing, role of government is now positive, private and public organizations have come forward side by side to attract the local and foreign tourists, researchers, dignitaries and foreign delegates. Having all the minimum requirements, the tourism industry could not develop adequately. The cracks of problem could not identify accurately because of paucity of sufficient number of research and investigations in our country. Out of different problems, the researchers have concentrated their focus to human resource development aspect for tourism sector in Bangladesh. It is due to low literacy rate of general people, they cannot communicate with the domestic and foreign tourists significantly. So, the tourists felt discourage to visit repeatedly to the tourist spots. It is not possible to increase literacy rate dramatically to develop communicative skill of mass people. The researchers feel that a group of personnel could be developed on an emergency basis to face the immense need of the tourism industry in Bangladesh. Presently, specialized formal education like bachelor’s degree, under graduate degree or postgraduate degrees are not available in universities of Bangladesh on tourism. No specialized training program is being found to develop skilled personnel in this regard. In some International Hotels, Parjatan Corporation and at private level tourist agencies very limited scope of on the job training has been developed. This study will facilitate the decision makers to assess the intensity of the problem and to plan accurate measures to train and develop a good number of manpower for facing the current need readily. This could benefit the tourism industry in multiple ways. This could change the economic picture of tourism sector and contribute a big share in the GDP of Bangladesh. Tourism has considered as the world’s largest and rapid growing industry of modern business world. It has a vital influence on economic development of a country. Bangladesh is a new tourist destination on the map of the world. Bangladesh has enormous potential to develop tourism because of its attractive natural beauty and rich cultural heritage. Tourism can add value in the Bangladeshi economy if proper marketing plan and strategy can be built and implemented for this purpose. However, this industry fails to reach its destination due to adequate marketing practices. This paper aims to show the present scenario of tourism industry in Bangladesh, identifies the constraints, and suggests remedial measures accordingly. The study also suggests that government should formulate a ‘tourism policy’ immediately for the development of this industry. Both public and private level investment is required in the tourism sector and regional cooperation can bring benefits for Bangladesh. Sustainable tourism can play the significant role for the development of tourism industry. Tourism in Bangladesh is of no exception from this. Lack of promotional activities is likely to affects the development of tourism in any country as well as in Bangladesh. But the existing literature on the sustainable tourism of Bangladesh tourism is very rare and even on the literature covering the marketing aspects of tourism industry in Bangladesh is very limited. As a result, the study is exploratory in nature. It was assumed that sustainable tourism is a vital force for an effective marketing strategy of tourism products and services. But Bangladesh is far behind from the realization of the fact and due to that Bangladesh could not take advantage of the full potential of the sector and which causes not to develop the industry significantly and expectation which could be and failed to earn sufficient amount of foreign currency. 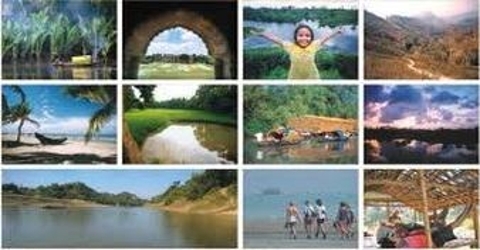 The present study on the use of sustainable tourism development in Bangladesh tourism industry is an attempt to highlight the issues related to promotion and put forward some suggestions to what actual promotional measures are best suited for attracting more tourists to Bangladesh and contribute more positively to the economy of the country. The research has been conducted based on secondary data. As it was mentioned earlier that the existing literature on the sustainable tourism development of Bangladesh and even on the overall marketing aspects is not adequate, the study was done to used secondary data in this study. To collect the secondary data, annual reports of BPC, related journals, periodicals, newspapers, BPC’s web page etc. were consulted. In addition to that for literature review and for other theoretical analysis different journals, periodicals, textbooks, internet and other related materials were consulted and used as references. Informative: Travelers not only learn about the destination, they learn how to help sustain its character while deepening their own travel experiences. Residents learn that the ordinary and familiar may be of interest and value to outsiders. Supports integrity of place: Destination-savvy travelers seek out businesses that emphasize the character of the locale in terms of architecture, cuisine, heritage, aesthetics, and ecology. Tourism revenues in turn raise local perceived value of those assets. Benefits residents: Travel businesses do their best to employ and train local people,buy local supplies, and use local services. Conserves resources: Environmentally aware travelers favor businesses that minimize pollution, waste, energy consumption, water usage, landscaping chemicals, and unnecessary night time lighting. Respects local culture and tradition: Foreign visitors learn about and observe local etiquette, including using at least a few courtesy words in the local language. Residents learn how to deal with foreign expectations that may differ from their own. Does not abuse its product: Stakeholders anticipate development pressures and apply limits and management techniques to prevent the “loved to death” syndrome. Businesses cooperate to sustain natural habitats, heritage sites, scenic appeal, and local culture. Ensuring Clean and Safe Environment:No one wants to visit a place that is not clean or unhealthy. Tourism cannot survive without a clean and safe environment. In a like manner, communities that do not provide pleasant surroundings and a clean environment have a very hard time attracting business. Having friendly people and good service: Tourism requires friendly people and good service. No matter what the attraction may be, a tourism centre that lacks good customer service and friendly people will fail. In the same way, communities that offer poor service not only do not attract newcomers, but, in the end, have a difficult time holding on to their local population, young people and businesses. Good restaurants, hotels and recreational facilities: Tourism requires good restaurants, hotels and recreational facilities. These are the same factors that are essential to any community seeking economic development. Enhancing community-based tourism: Bangladesh can be an ideal destination for community-based tourism. For sustainable progress in poverty eradication, the present time is suitable for considering the implementation of community-based tourism. Bangladesh is a country of thousands of villages. Most of its heritage sites and international tourist spots are positioned around villages. These are intended for education as well as recreation. Tourism campaigns on Special Attractions: Sometimes rare plants or animal species are the main attraction, sometimes traditional food, handicraft or historic buildings. A European example of well-developed rural tourism is France. Camping and caravans are the most popular forms of accommodation in rural areas, many of them on farms. Many farmers have developed camping sites on their farms. Enhancing community-based rural tourism: Bangladesh has huge potential for tourism. The concept of community-based rural tourism and its benefits are still unexplored.Now is the right time to think of rural tourism development. Apart from rural tourism, all general attractions, like archaeological sites, historical places and natural beaches are, more or less, getting importance. Rural tourism can turn into a booming sector for at least two reasons. First, through rural tourism, Bangladesh may rid itself of poverty, and second, the infrastructure of far-off and rural places will be developed. Community-based rural tourism is a must for the economic development of Bangladesh. Taking Enhancing community-based tourism as a must: The government and community leaders may also want to take into account that tourism adds prestige to a community. People like to live in a place that others consider worthy of visiting. Such pride in one’s nationality or community can become an important tool for developing the economy. Community Association & Tourism: People sell their community’s best when there is agree at deal to see and do in it, when it is safe and secure, and when customer service is not merely a motto but a way of life. Community festivals, traditions, handicrafts, parks and natural settings all add to the desirability of a locale and its ability to sell itself to potential outside investors. The quality of life can also be reflected in a community’s museums, concert halls, theatres and uniqueness. Tourism focusing on emerging and minority communities: Tourism is an important economic development tool for emerging and minority communities around the world. Since tourism is based on the appreciation of other cultures, tourism industries have been especially open to giving disadvantaged groups around the world opportunities that have often been denied to them by other economic sectors. Employment Generation: Tourism requires a great deal of construction work andprovides large numbers of entry-level jobs. Tourists may infuse additional money into the local economy through shopping. In nations where manufacturing is not developed, the tourism industry can be an essential method for reinvigorating local economies. Focus on innovations: Focus should be made on innovations like eco-tourism. The number of eco-tourists in the world has been increasing by more than ten percent a year. Initially, Bangladesh may set its target to attract one million eco-tourists a year. To achieve that target, it will have to chalk out a down-to-earth tourism marketing strategy and go for aggressive marketing in countries, which produce most of the outbound tourists. Tourism Fairs: Nowadays different organizations often organize tourism fairs in Bangladesh, in which mainly outbound tour packages are sold. Sending tourists from Bangladesh to other countries cannot be treated as the development of tourism in our country. These fairs are sellers’ fairs in character from the perspective of Bangladeshbecause the foreign exhibitors or their counterparts in Bangladesh sell outbound tour packages, and only a few offer domestic tour packages. The problems facing tourism and the development of a sustainable tourism sector in Bangladesh is diverse its own touristic features, level of development, and national development priorities and policies. In Bangladesh, there still is a fundamental lack of basic cognisance of the economic importance of tourism as an industry and its positive impact as a potential source of foreign exchange and employment. Quality of service needs to be improved. For the purpose, training at different levels from top management down to door boys – should be initiated at national and regional levels. In this context, Thailand, the most successful country in tourism within BIMSTEC, can take the lead. In Bangladesh, there is lack of training knowledge between tourist guides. Training should also be provided to promote activities that are indirectly linked to tourism, such as printing, dying and folk-arts. Special training for women might be needed in many cases. Bangladesh has the lack the sufficient infrastructures necessary for the development of a successful tourism sector. Primary amongst these are hotels and lodging services, transportation and communication, safety and security and tourism information services. This makes it difficult to provide the standards of facilities and services which tourists require. In Bangladesh, the development of tourism is impeded by their lack of inherent natural, historical or cultural tourism resources. However, as mentioned earlier, though it is a crucial factor, tourism heritage assets alone cannot make a successful tourism industry. Even when that fundamental awareness is there, in many cases there is generally a lack of tourism knowledge and professionals. Tourism, as a modern industry, is recent in the world. It is also a new and unfamiliar activity in Bangladesh. Another related problem is the absent or weak publicity promotion and mass media exposure due, in many cases, to the limited technological services available. While investment in services is a well-established economic activity in the developed countries, it is still lagging behind in developing ones. Investment in service-oriented projects, particularly tourism, in developing countries is often regarded as a high-risk task. Accordingly, though they may have a natural tourism potential, it is very difficult for Bangladesh to gain access to reasonable financing for their touristic projects even when they manage to tackle the problems of project identification and planning. In Bangladesh, there are still difficulties in getting integrated tourism policy-making due, in general, to policy conflicts between the government departments and the tourism private agencies. This is coupled in many cases with the lack of effective administration, regulation and institutional frameworks of touristic activity. For many years, international tourism has been characterised by its concentration in coastal or watercourse areas, and in summer for rest, relaxation and leisure. However, modern touristic activity has shown a growing tendency towards diversification and change. This makes it difficult for Bangladesh, including those with a relatively developed tourism sector, to keep pace with the rapidly changing and complex requirements of tourists. In a highly competitive international tourism market, and considering the emergence of new touristic destinations, improvement of the conditions that foster modern tourism development is not an easy process. The safety of tourists is among the primary factors for any successful tourism industry and should, thus, be one of the basic objectives of tourism planning and provisions. Safety- related tourism problems, whether real or perceived, exert a negative impact on the reputation of host countries. In this regard, negative perceptions appear to play a detrimental role in the prospects of tourism in Bangladesh. Even such factors as rumors may cause great damage to complete tourist seasons. To meet the various requirements for sustainable tourism development, a number of issues need to be addressed and specific actions need to be taken at the national and regional levels. Attention also needs to be given to the various modalities for implementation of those actions. Attention also needs to be given to the development of strategies for the implementation of the action plan within a specified time-frame and the mobilization of resources. Human beings are at the centre of concerns for sustainable tourism development. In order for tourism development to provide benefits to people in host countries and satisfaction to the tourists visiting those countries, the positive contribution of the tourism sector needs to be sustained and negative effects minimized or eliminated. This requires that all people involved in the tourism industry have foresight, commitment and the tools to plan and manage in a way that meets present needs without compromising the ability of future generations to meet their own needs. While tourism is an economic activity largely carried out by the private sector in most countries, national governments make policies and plans for tourism development in terms of national economic objectives. These objectives aim at earning foreign exchange, creating employment, attracting investment and ensuring more equitable and more widespread distribution of income. Sustainable tourism development, on the other hand, involves almost all aspects of life, and this means that the tourism industry must be viewed as an integrated whole with an impact on not just the economy, but also society, culture and the physical environment. This requires consideration of what tourism does to the environment and the quality of life, and how it affects the needs of local people. The tourism industry is characterized by a range of various interests held by a number of different stakeholders. In order for the various groups to resolve differences or conflicts, governments must take the lead in fostering cooperation and collaboration. This can be done by ensuring that the integrated, sustainable features of the industry are kept in mind as all stakeholders express their views and interests, and that decisions are made accordingly. Coordination, management and planning by government agencies are prerequisites for creating the modalities to sustain tourism development and ensure that stakeholders keep in view their collective interests. Sustainable tourism development requires direct attention and explicit statements with regard to policies and future plans. The recommendations of various meetings, seminars and workshops, including the Intergovernmental Meeting on Tourism Development, have shown that there is considerable scope for strengthening national capabilities and promoting regional cooperation in achieving sustainable tourism development. There is a need for a clear mandate from the government to facilitate appropriate roles for the various stakeholders. There is also a need for integrating and coordinating tourism policy-making and planning with the full range of other government agencies, such as those involved in infrastructure, human resources development, environmental management, immigration, border-crossing formalities and social development at the community level. Both substantive and procedural policy issues which influence the strength of national capabilities were considered at the Intergovernmental Meeting on Tourism Development. These policy issues serve as the parameters for the present draft plan of action. Indicated below are some of the major policy issues which need attention. Tourism policy: The tourism policy of a country provides the most explicit indication of the governmental approach to sustainable tourism development and the role that all stakeholders in the tourism industry need to play. As part of tourism policy, organizations can be set up which are able to set objectives, formulate plans and implement programmes. Information: Policy makers also need reliable information and good-quality data on a timely basis in order to appreciate the complex and long-term interactions that tourism has to maintain with the rest of the economy. If information or data are lacking, then the importance of the contribution of tourism to sustainable socio-economic development tends to be overlooked. In our country, the national tourism organizations do not receive enough resources, and their capabilities therefore remain limited. Planning has both policy and operational elements which form part of the process by which the government decides on objectives, sets out the means for achieving the objectives and sets priorities. Policy planning involves the long-term outline of general goals, objectives and directions for sustainable tourism development. Operational planning covers the strategies and procedures to be implemented in order to carry out the policy. Integrated planning also requires reliable and timely information in order to highlight clearly the links between national economic development and the tourism sector. Development of a tourism master plan and introduction of integrated tourism planning are appropriate approaches for sustainable tourism development, because all aspects can be covered in a comprehensive way, including the social, cultural, economic and environmental aspects. A master plan and integrated tourism planning can indicate that the tourism sector is a major part of the national economy and that the planning process will be ongoing and action-oriented in ways that facilitate implementation. Managing sustainable tourism development involves leading, coordinating and controlling in order to bring together all of the resources that will contribute to formulating and implementing the national tourism policy. Administrative issues are also involved as they relate to setting up the structure of a national tourism organization and defining its functions and responsibilities. Leading the development may involve setting up councils or committees at the highest levels of government to underscore the commitment, and being a catalyst for sustainable tourism development. Coordinating may require working with the various stakeholders from the national level to the local level in order to set priorities and create consensus for action. Controlling may include establishing mechanisms, laws and regulations that ensure coherent inter-sectoral coordination within the government and that will promote broader participation and spread benefits more widely to sustain tourism development. Management can also become more effective if supported by systematic, reliable information. Such information can also play a role leading to greater awareness of the opportunities and benefits that could be derived from cooperation and sharing among countries at the regional and sub-regional levels. In most Asian and Pacific countries and areas, the private sector is recognized as a major stakeholder since it is largely responsible for providing tourism services. So Bangladesh has to encourage private sector for this potential sector. One of the most important issues has been how to attract greater private sector participation, including development of partnership between the public and private sectors. Under the overall framework of strengthening national capabilities and promoting regional cooperation in sustainable tourism development, the plan proposes action at the national level and supporting action at the regional level. In this context, six theme areas have been identified in which specific action is required. The theme areas are: (a) human resources development in the tourism sector; (b) the economic impact of tourism; (c) environmental management of tourism;(d) infrastructure development and investment for the tourism sector; (e) facilitation of travel; and (f) regional and sub-regional cooperation in tourism development. Some of the action required in each theme area is indicated below. Bangladesh faces the general problem of lacking strategies and policies for human resources development for tourism. The need to develop the required human resources for the tourism industry has become imperative as a result of the rapid growth of tourism. Some of the specific problems which need to be addressed include:(a) the quantity and quality of human resources which are related to the labor-intensive nature of the industry and the need for a high standard of specialized skills in cross-cultural working environments;(b) the shortage of tourism training infrastructure and qualified trainers in many countries;(c) the lack of national legislation and guidelines to improve the working conditions in the tourism industry. The net contribution of tourism to the economy is often not known, beyond a general awareness of the economic benefits, with the result that effective and appropriate policies cannot be made. To overcome this problem, reliable, systematic research on the economic impact of tourism is needed. A realistic assessment of the economic impact can help to make integrated planning easier, strengthen the links between national economic policy-making and sustainable tourism development and enable better understanding of how to enhance the economic benefits from tourism. Countries could also learn how to enhance the economic benefits from tourism by studying each other’s experience. The problems related to the environmental management of tourism development arise from the complex relationship between development and its impact on the environment. The problems of adverse impacts could be tackled through effective planning and coordination of action, enforcement of legislation and governance. Problems with legislation relate to the enforcement of laws, the lack of human resources trained to monitor and enforce the laws to understand that compliance with the law provides long-term benefits that sustain tourism. There is a close and dynamic relationship between infrastructure development and sustainable tourism development, because inadequate infrastructure is one of the most serious constraints on future tourism development. To overcome constraints and problems, an integrated planning approach and formulation of master plans should be encouraged. The government should create an environment conducive to private sector investment and provide adequate incentives to that end. In addition, infrastructure requirements for tourism development should be properly integrated with the full range of a country’s infrastructure development and investment requirements. A wide range of travel facilitation problems could impede sustainable tourism development. These problems may include lack of accessibility by air, road, rail and water transport; inefficient policies and procedures for visas, customs and currency; possible threats to the health and safety of tourists; the lack of information services for tourists; a negative image if there is overpricing; shortage of trained people in the government and the tourism industry; and the complex nature of border formalities and customs regulations. Governments have a direct role to play in making policies, rules and regulations and providing infrastructure affecting these factors. Countries and areas in the region, and different sub-regions individually, may have limited accessibility, lack resources and/or capabilities or have inadequate arrangements for expanding tourism. Regional and sub regional cooperation could help governments and the tourism industry in addressing many problems more effectively by sharing information, facilities, experience and expertise. The national action and supporting regional action enumerated above provide a clear guide to the specific responses that are part of the action plan. One or more modalities may facilitate the achievement of each action. Governments and regional organizations are encouraged to be innovative and imaginative in preparing approaches which make use of national and regional resources. A number of modalities are listed below which could enable implementation of the proposed national action. A number of modalities can be used at the regional level to play a supportive role or serve as catalyst for the process of sustainable tourism development. Coordination and cooperation are the crucial factors for effective implementation of policies, plans and programmes to promote sustainable tourism development at the national level. Such coordination and cooperation are also necessary among international, regional and sub regional organizations and agencies which provide assistance to countries, both within and outside the United Nations system. The scale and coverage of the action plan would start with a thorough examination of current practices. Such an examination would help in the implementation of far-reaching proposals for action designed to strengthen national capacity for sustaining tourism development. In this connection, the tourism sector could thus play a more effective role in national development. The potential benefits from the action designed to achieve sustainable tourism development would justify the resources needed to achieve a new type of socio-economic development. Plan to make a new tourism policy, which should be in tune with the new national economic, social, environmental policies and trends. The new policy should recognise the roles of both the public sector and the private sector in the development of tourism. The support for women to become self-employed through tourism-related activities should be linked with micro-credit programs. Loans to women’s initiatives should be included as a means of creating opportunities for the industry to buy and source locally, thus maximizing the benefits for local communities. Training should also be provided to promote activities that are indirectly linked to tourism, such as printing, dying and folk-arts. Development of the handicraft industry should form an important part of strategicplanning for community participation in tourism, especially the participation of women. The tourism industry and tourism boards should abolish marketing strategies using women’s stereotypical images as part of the product. Employers should review their standards and criteria for employing women and men, and their policies to protect women from sexual objectification and sexual harassment by customers. The development of tourist facilities should be taken up in a planned manner at government and non-government levels. Steps should be taken to improve domestic tourism. This has increased during the last one decade. But there are no statistics on its growth. Parjatan Corporation and private tour operators should have field offices outside the country. Tourism should be integrated with all the national events, either cultural or religious. E-tourism is one of the fastest-growing e-commerce sectors. It also increases hardware and software purchases. E-tourism is also important for a developing country like Bangladesh, because it could generate employment and foreign currency earnings. Parjatan Corporation and the private tour operators should take it up seriously. A National Responsible Tourism Award should be initiated immediately for those who make positive contributions to conservation and the economies of local communities while minimising the negative impacts of tourism. Tourism is a publicity dependent industry. Bangladesh Parjatan Corporation and the TOAB Should prepare more dependable and attractive publicity items, including tour itinerary, for distribution. The tourism industry in the country should have an effective marketing policy. Human resource development for tourism through formal and informal education, training and exchange visits is of utmost importance for most of the BIMSTEC countries. The ministries of Tourism and National Tourism Organizations of the BIMSTEC countries need to be strengthened. Quality of service needs to be improved. Governments, local governments, employers, trade unions and community groups shouldjointly create community based institutions and services to help women and men to cope with the double burden of family and household work as well as work outside the home to generate income, such as child care facilities, which, in turn, can create jobs. The industry can look into opening child-care facilities in tourist resorts for the children of the employees. The significance of tourism is viewed from many angles like economic, social, cultural, political, etc. Tourism is now the fastest growing and single largest industry in the world. The industry has attained the impressive growth in the world-wide in terms of tourist arrivals and foreign exchange earnings which has led the ever increasing competition among the destination countries and gained the top priority in most of the destination countries. Every destination country is trying to attract more tourists by drawing the attention and growing the interest among the potential tourists through adopting effective marketing strategies. Promotion is an important element of marketing mix and plays a vital role in developing marketing strategies. As such, the government, the tourism traders in the country, and other concerned should take immediate measures to develop this vital sector and enhance its contribution to its socio-economic activities of the country. Its hould be noted that ‘development of tourism industry does not mean only an increase in earning of foreign currency from this sector’. Rather, the number of foreign tourists that arrive to a particular country is taken as the yardstick worldwide for measuring the development level of tourism Judged by any standard. Therefore, it is essential to rightly recognize and explore the potentials of this industry in Bangladesh immediately. We need to establish domestic tourism which is socially and psychologically acceptable, environmentally and ecologically sustainable, and economically viable. The benefits that are received from tourism should be fairly distributed, and then only will tourism be participatory, and, thus, the rights of local residents will be properly recognized, and tourism will be responsible and sustainable. If all these development, promotional and managerial strategies are undertaken and implemented in a an integrated manner by different role playing agencies, tourism sector in Bangladesh would definitely yield positive results in terms of exploitation of future potentials, maximization of foreign currency earnings, employment generation, and social and cultural development. So, sustainable tourism development is essential to promote our tourism industry to the worldwide.